For a wonderful, low maintenance plant that is used in garden beds or as a border you should consider planting Agastache. It can be started from seed, or from a container. Agastache is deciduous and it will die back during the winter months, but as a perennial it will come back the next season. 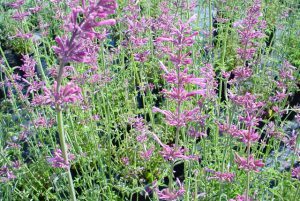 Also referred to as “Hummingbird Mint” the Agastache is well known for its ability to attract bees, butterflies and hummingbirds. 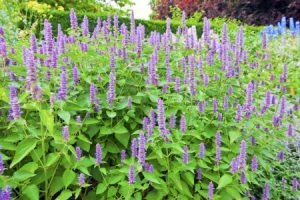 This plant will grow to stand 2-3 feet tall, by 1 ½ feet wide. It needs to be planted in full sun, and can tolerate dry conditions. There is a low to medium watering requirement after establishment. Agastach blooms well throughout the summer, but there will be a greater display of flowers in the second season. There are many different varieties of Agastache. Two of the best are “Tutti Frutti” and “Blue Fortune”, both shown in the above photos. The Tutti Frutti variety is a woody stemmed perennial which produces a tube shaped rose-raspberry flower. Its leaves give off a light lemon scent which adds to the attraction of bees and other insects. It needs a good winter mulch to re-establish in the following spring. They can be grown as an annual in zones colder than zone 6. Blue Fortune blooms with a showy blue flower spike from spring through late fall. It is a fantastic pollinator and thus great for attracting bees and butterflies. 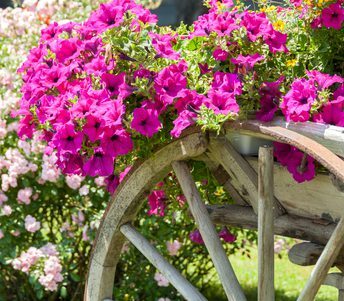 Because this plant gets 3 feet high it is ideal for a background fronted by smaller flowering annuals or ornamental grasses. It loves full sun and is drought tolerant.